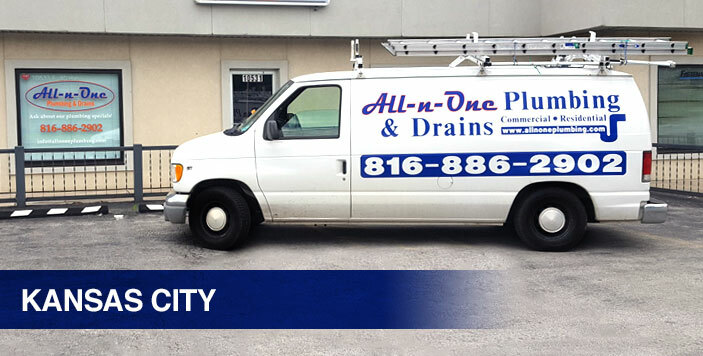 Finding high-quality plumbing solutions is easy when you call (816) 886-7600 for professional service from All-n-One Plumbing. A Kansas City plumber is always ready to help, so don’t delay – call today and get solutions you can count on. Save on your next service by accessing our latest online coupons. Are you looking for a Kansas City plumber that is committed to more than just solving your issue? You’ve come to the right place! At All-n-One Plumbing our team of experts are not content to simply get the job done – we also want to ensure that every one of our customers feels satisfied and happy with our services. We understand that there are lots of plumbing companies out there, so what sets us apart? One key area is that we were founded with the intention of delivering customer service that goes above and beyond every time. Since 2007 our technicians have made it their mission not only to deliver outstanding plumbing repair, installation and replacement services but also to put an emphasis on quality workmanship and customer service. Free estimates available: Our technicians are happy to provide free no-hassle quotes so you can make an informed decision when it comes to your plumbing system. Customer service is a priority: We take the time to give your situation the attention it deserves, and we pride ourselves on our detail-oriented approach to solving your problem. Top-notch professional service: Our team believes that a job half-done is a job not worth doing, which is why we go above and beyond with every job we do! Our work is backed by warranty: If you are not completely satisfied with the service you have received, we will return and do everything we can to make things right. We do not consider the job done until you have a smile on your face. We work quickly and efficiently: We know your time is valuable, which is why we never waste it by arriving late or carrying out shoddy work. You can expect top-quality service from start to finish. Don’t leave your plumbing to chance! Call (816) 886-7600 and get the same expert solutions that so many of your neighbors in Kansas City, MO have been enjoying for years. There is no one-size-fits-all solution when it comes to your plumbing problem. Every customer can expect a customized approach - because that’s what you deserve! You can rest easy knowing that you can trust us. With our 100% satisfaction guarantee and our free estimates, where can you go wrong?